Immediate access to lap times and all data needed for engine tuning and improving driving technique. With AiM's new GPS05 Module and GPS Manager software (included), you can immediately get lap times and data needed for improving driving technique by incorporating it into your AiM data logging system. The newest GPS05 Module is faster in satellite signal acquisition and more reliable in adverse situations. It includes the receiver and antenna in a single unit, making installation even easier. The GPS Module includes the new GPS Manager, which allows you to set track start/finish lines and splits. AiM's GPS05 Module connected to AiM loggers delivers tons of important information such as chassis analysis, track position, etc. 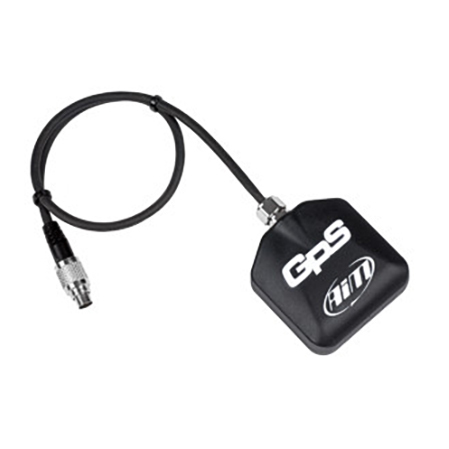 When added to an AiM MXL Pista, the GPS module eliminates the need for the beacons. Not needed with SmartyCam or EVO4 and is NOT a replacement for the smartycam antenna.